Over the years, I have made quilts for various special friends and this is one of them. Alex and his fianceè are ethnic Chinese and I know that Alex (at least) speaks Mandarin. 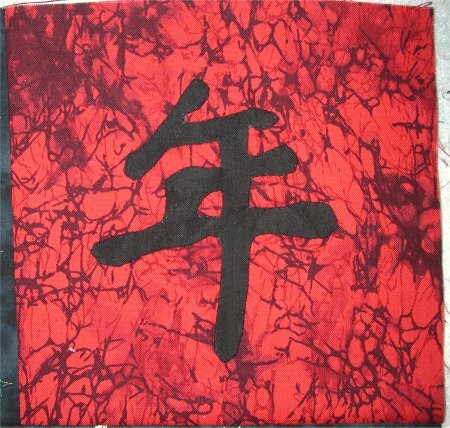 I wanted his quilt to reflect (in part) his heritage and to that end, I decided to incorporate an appropriate marriage sentiment in Chinese characters in the quilt. I enlisted the help of my dentist & wife, who are also ethnic Chinese. My dentist's wife went to Chinese school when she was younger and although she said she can write Chinese, it isn't "pretty". However, one of her friends is a "real artist" and she asked him to write such a sentiment. The gentleman did and the result was a *lovely* brush-stroked set of characters that, loosely translated, means "One hundred years happy union" .. more or less. :-) I took the written characters to Kinko's and enlarged them to be the size I needed. I knew that I would need to hand-applique the characters and applique isn't one of my strong points. For the first time, I used the "freezer paper on top" method of applique and am extremely happy to report that this technique worked VERY well for me. I'm very happy with the way these blocks turned out. One of the hardest parts of these quilts is deciding what design to do ... something that I want to make and one that the recipient will (hopefully) like. For Alex's quilt, I decided to do a Lone Star (Star of Bethlehem), not because I knew he liked it specifically but because I just got a bee in my bonnet to do one. :-) I knew that the background of the Chinese characters would be a red fabric with the characters in black, so the Lone Star needed to have some of that red fabric in it. I also knew that red is considered a lucky color in Chinese culture, but didn't want to do the entire quilt in red ... just in case it might turn out too overpowering for them. 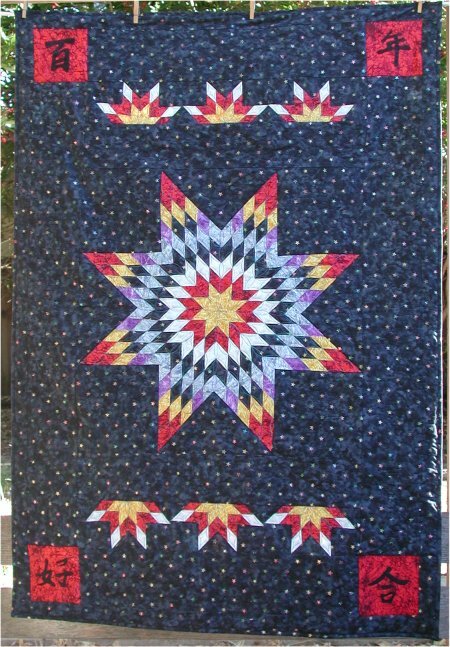 During the 2004 Arizona Quilt Retreat, I was looking thru Ami's (SewingUpAStorm) book that had pictures of variations of Lone Star quilt. Some of the most striking ones used the background fabric *in the Lone Star*, which gave a lacey impression to the Lone Star, since the background fabric in the Lone Star makes it look like there are holes in the design. I was also extremely pleased to find that all but part of the backing would be able to come from my stash. Because I didn't need to buy *more* new fabric for the entire quilt, the cost of the quilt had already been incurred (I kinda feel that this makes the quilt "free" [grin] ... an idiotic rationalization, I know). The Lone Star, by itself, yields a square medallion, which isn't the shape I wanted for this quilt. What I wanted was a throw sized quilt; not only was the smaller size something that I could put together quickly but it's also a size that I can quilt myself at home. Oh .. did I mention that the wedding is this August? Unfortunately, circumstances didn't allow me to work on this quilt beforehand, so a bigger quilt wasn't really a viable option. Anyway, to expand the square medallion into a rectangle, I put accent borders of smaller "half" Lone Stars on the top and bottom of the Lone Star, then surrounded the entire thing with more borders of the background fabric. The Chinese characters became the cornerstones of the final outer border. Using the background fabric as the borders allowed the Lone Star and accent motifs to float. 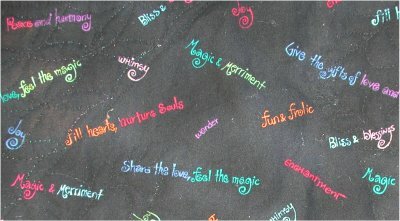 The backing of the quilt consists of a large square of fabric that has many romantic sayings in colorful text on a black background. Top and bottom borders are from other fabric that reflect their Chinese heritage (chopsticks, fortune cookies) and from a computer/Internet motif that reflects how he & I first met. I'm *very* pleased with the center Lone Star medallion! It came out perfectly flat in the center and most of the diamonds meet nicely at the points. However, I'm not as pleased with the half Lone Star accent blocks. I had to resize the block to make it fit the center medallion and somewhere between the resizing of the pattern and the actual execution, the blocks came out slightly smaller than I wanted, forcing me to add on spacer blocks to the ends. I think I also must have skewed the cutting or stretched some of the bias edges somewhat because, for whatever reason, they wouldn't align correctly horizontally at the outer star points. [sigh] I 'm pleased with the overall look of the quilt but close inspection reveals the flaws. [sigh] I haven't quilted it yet .. that will have to wait until August, when I return from our latest trip. Then comes the very scarey step of mailing the quilt to them and HOPE that nothing goes awry during the delivery. [fingers crossed]. Later note: the quilt was eventually mailed and successfully received. 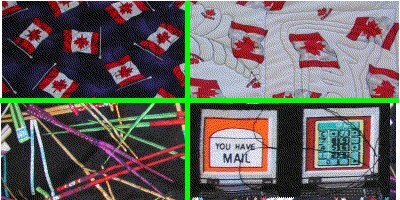 I always worry about mailed quilts. When I subsequently talked with Alex, I asked him about the Chinese characters .. I was expecting some amazed expression on his part ... but to *my* amazement, he confessed that he couldn't *read* Chinese! (nor could his wife).